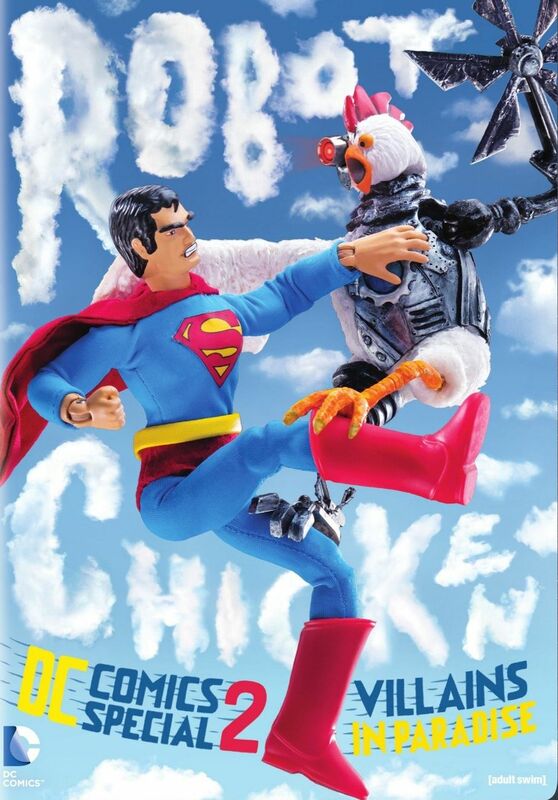 Robot Chicken DC Comics Special 2: Villains in Paradise is here on DVD! My wife and I enjoyed this episode when it first aired, and we enjoyed it just as much watching it again on DVD. Like all Robot Chicken episodes, it's difficult to give a plot summary since there really isn't much plot, just a bunch of short little skits. This episode focuses on DC comics super villains, though DC superheroes do make an appearance as well. It's a great episode, but at only 23 minutes it doesn't really deserve it's own DVD. They did the same thing with the first Robot Chicken DC Special, and to beef up that DVD they included a bunch of extra features. And this release has a bunch as well, including a making-of featurette and two separate audio commentaries. Like the previous Robot Chicken DC Comics Special, this is a hilarious episode and definitely worth watching. Normally I'd say it's not worth buying for just one episode and a bunch of extras, but it's only $10 at Amazon.com which seems quite reasonable.